Latest Version 1.3.2 – Feb 13, 2018 – view changelog WordPress 4.9.2 Ready WooCommerce 3.3.x Ready Visual Composer 5.4.x Ready Rubino – Unique eCommerce Theme is an easy way to start selling everything online. 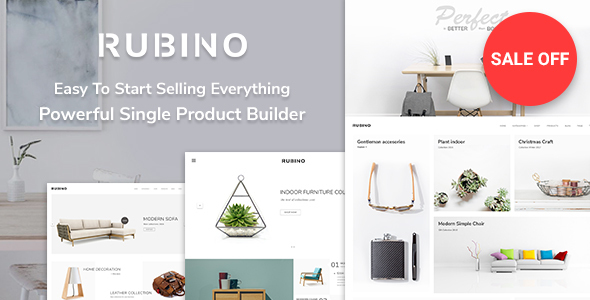 You will get amazing experiences during eCommerce site building process with endless options in single product builder, footer blocks, flexible shop layouts, and premium plugin integrations that Rubino dedicates. Rubino goes beyond basic eCommerce theme with these core features below! Compatible with WPML, WooCommerce 3.3.x, WooCommerce 3.2.x, WooCommerce 3.1.x, WooCommerce 3.0.x, Visual Composer 5.1.x, Visual Composer 4.12.x, Visual Composer 4.11.2.1, Visual Composer 4.11.x, Visual Composer 4.10.x, Bootstrap 3.x. Rubino has been tested with browsers IE11, Firefox, Safari, Opera, Chrome, Edge.